In part 1 of this Andaz Mayakoba review I covered an overview of the hotel, our flawed check-in experience and our room. In this part of my Andaz Mayakoba full review, I’ll cover everything else you need to know! Over the course of our four day stay, we had the opportunity to dine in a couple of the resort’s restaurants in addition to ordering room service. At check-in we weren’t told anything about our benefits as Globalist members, but I blame that on the confusion and don’t really hold it against them. After finally inquiring with the GM, I was able to confirm that Globalists can take their breakfast at the buffet in the main restaurant Cocina Milagro (Lagoon Side) or order a-la-carte at OllaTaco (Beach side). We decided to take our breakfast each day in Cocina Milagro since the buffet and menu were quite a bit more extensive than what we could get at OllaTaco. Even though Cocina Milagro is a buffet, they did allow guests to order a-la-carte dishes such as Huevos Rancheros, Eggs Benedict and a few others. Overall I would say the buffet spread at the Andaz Mayakoba is more sparse compared to what I have seen at other Andaz properties, but the quality of the food was fairly high. We also thought it was nice that they allowed guests to take some food out in to go boxes. We were a bit hesitant to do this, but were encouraged by the staff. Since the Andaz is fairly isolated, we ended up eating all of our meals on property. Several of the restaurants at the other resorts looked tempting, but we never made it to them. On most days we ate the breakfast buffet around 11am which meant we were good through dinner. On the first night we ate at OllaTaco, which is the resort’s casual Mexican restaurant located on the Beach Side. As I mentioned in part 1, our meals were paid for by the hotel due to the room situation. We ended up having 2 orders of fajitas, rice, beans and guacamole and the total was around $80 USD. The food was good, but nothing special. On another night we ate dinner (also comped) at Cocina Milagro. For the most part everything was great, but the deconstructed Clam Chowder was cold and gritty. I will say the duck I had was absolutely delicious despite the boring presentation and the rest of the food was very good. At about $250 USD for two appetizers, two mains and two desserts it is pricey though. Room service pizza. Tasty, but not anything special. Duck at Cocina Milagro. Very tasty. 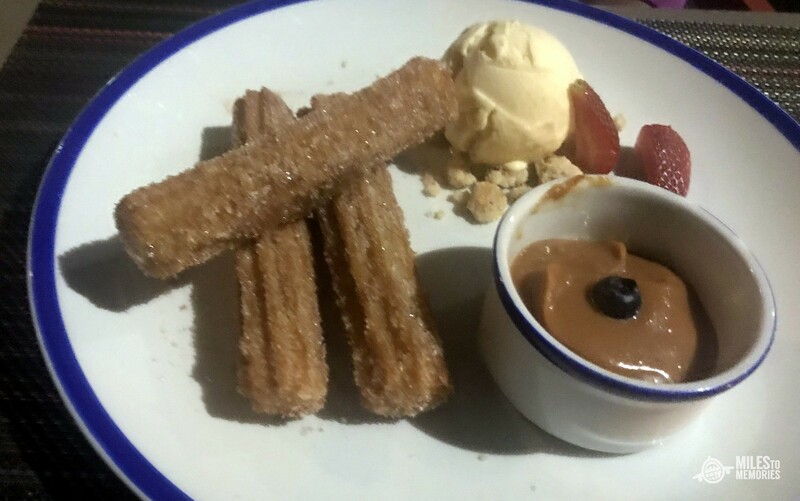 Yummy dessert at Cocina Milagro. For our other two nights on property we ended up ordering room service. Compared to the restaurants, room service was a cheaper option, but we mostly chose this because 2 year olds can only handle so many sit down dinners. Over the course of our two meals we ordered pizza, soup, a burger and a club sandwich and all were fine. After the room miscommunication the first night I did ask to speak to the General Manager. The next day after we missed his call, he actually set out to find us which was nice. Unfortunately our brief conversation was unsatisfying since he defended his staff and seemed to hint that I had misunderstood them. To his credit he offered us the second dinner at Cocina Milagro, even after our first night’s meal had been comped. While the service issues at this property began at check-in unfortunately they did not end there. Over the course of the four days, we saw a staff that didn’t seem to understand how to provide great service. Nor did they seem to care. We received slow service on the beach and at the restaurants and also consistently (as in every single day) had to wait for our room to be cleaned despite notifying housekeeping and leaving for 1-2 hours. We also had to wait quite a while for golf carts on several occasions. To their credit, the golf cart drivers were among the friendliest of employees. Be prepared to wait for golf carts or to bike your way around. The absolute worst service of our stay came during our second comped dinner. Our waitress at Cocina Milagro was among the worst I have ever had at any restaurant. She was rude, disinterested and didn’t seem like she wanted to be there. Our service for breakfast at the buffet was also fairly poor. We often had to wait quite a long time for water/juice and then had to flag our waiter down for refills day after day. Since our breakfast and gratuity were included as a benefit of being Globalist members, we didn’t tip extra at breakfast and that seemed to hurt us. We did see some waiters giving free stuff to other patrons in exchange for tips and they often would hang out at these people’s tables giving them whatever they wanted. I understand their want for tips, but this shouldn’t happen at the expense of others. The bottom line is the service at this hotel is anything but refined. The Andaz Mayakoba is split into two sections separated by about 1KM of mangrove jungle. The Lagoon Side houses most of the resort amenities including the lobby, gym, kid’s club, spa, meeting space and two restaurants. The Lagoon area also has two pools and two hot tubs which feed into the pools. This is important since the pools Lagoon side aren’t freezing because of it. While the Beach Side is quite a distance from the Lagoon, it is very close to the ocean and has two restaurants along with a beautiful pool that unfortunately isn’t heated. While the pool was a bit too cold for everyone, the ocean and beach chairs were nice (although of a noticeably lower quality compared to the other three resorts) and there seemed to be enough for everyone. The main way guests travel between areas of this massive resort is via golf cart. Most times golf carts are constantly running between areas, although we did have to wait up to 10-20 minutes several times to get between the two areas. Thankfully for those active types, bikes are available everywhere on property. If we didn’t have the baby that would have been a neat way to get around the relatively flat area. Mayakoba’s uniqueness comes from its canals. Twice daily the Andaz has a boat tour of the canals which I highly recommend. The tour goes through the various canals and during it you will see the other resorts, some of the golf course and at times nothing but jungle. It is fantastic. Andaz Mayakoba Eco Boat Tour. Of course the real reason to go on the tour is the wildlife. Despite the canals being manmade, wildlife has really taken over and there are a ton of things to see. During our tour we saw dozens of colorful species of birds, iguanas and even a baby crocodile. It is sort of like having the Jungle Cruise right in your hotel! While we didn’t have time to eat at the other resorts it is quite possible and you can even charge back to your room to earn points. We did have a chance to tour the other hotels though and they are quite beautiful. The highlight for us was the giant tree at the center of the Banyan Tree Lobby. All four resorts also share a common area called “El Pueblito”. This collection of shops and street vendors is meant to simulate a traditional Mexican town. While it doesn’t really compare to the real thing, we found it nice and worth a quick visit. For those who are looking to worship, there is even a Catholic Church in El Pueblito which holds a Sunday Mass every week. Next to El Pueblito is Cenote Burrodromo. From the path you descend a few stairs into the cenote which is full of bats and stunningly clear water. The Andaz runs tours here several times during the week or you can just ask at the Sanctuary and they will drive you over on a golf cart. When I researched this property, it was hard to decide which side of the resort to stay on. After having stayed there, I can say I would definitely stay on the Lagoon side unless I had an ocean front room facing the water. There simply is too much waiting and inconvenience when staying on the Beach side since most activities and the better (warmer) pools are up top. If I go back, I’ll definitely stay in a Lagoon View room. Overall I really enjoyed my stay at the Andaz Mayakoba and would probably go back. I won’t lie, the service missteps really added up and had us frustrated by the time we left the resort. With that said, I feel like the two complimentary meals were very generous and didn’t feel the need to complain further. Oh and did I mention the resort is gorgeous? In the end I wouldn’t recommend this hotel if you are going for five star service because it simply doesn’t exist here. If that is less important to you and you simply want to enjoy the uniqueness of Mayakoba, then this can be a great choice given its cheaper price tag compared to the other hotels in the complex. Have you stayed at the Andaz Mayakoba? Let us know your thoughts in the comments. Andaz Mayakoba Beach Suite patio and plunge pool. Andaz Mayakoba Beach Suite view to the right. Andaz Mayakoba Beach Suite view to the left. Andaz Mayakoba Beach Suite view straight out. Andaz Mayakoba Beach Suite living room. Andaz Mayakoba Beach Suite bedroom. Profit is nice and travel rewards are the kicker! This property has amazing bones, but the many service missteps became frustrating during our four night stay. Previous articleFrom Around the Web: Wynn is Getting Even Bigger in Vegas, How to Get a Money Order with Mastercard GC’s , How to Cancel Annoying Subscriptions & More! Next articleClean Slate Series: Year 2 Of Applications, What I Would do if I Were Starting Out Now! My wife and I were vacationing at the Fairmont Mayakoba last spring and took the opportunity to dine at Casa Amate at the Andaz. It was a stellar night we will not forget. The food, wine and atmosphere were outstanding but the service was heartfelt and honest. It doesn’t sound like you had the chance to dine there. That’s too bad. It’s a special place we want to return too soon. I’m glad that you had an amazing time. With a baby it would have been hard to try Casa Amate but given the quality of the food at the other restaurant I’m not surprised it was good. Thanks for sharing your experiences! Was anyone concerned about crocodiles? They are deadly as that tragic Disney event illustrates. According to several staff members, only babies are allowed to remain and once they grow they are removed. I don’t know how true this is, but we obviously didn’t walk along the shores of the Lagoon and we certainly only saw the one baby during our boat tour. I really appreciate this honest review. I LOVE the Fairmont Mayakoba and have been interested in this resort since it opened. It sounds like it’s not quite ready for primetime. I dislike snarky comments so please don’t take this as such but i’m surprised that you bought that “Gratuity is included” as part of your Globalist breakfast benefit. Do you really think that the hotel seeks out your server and gives them extra compensation for serving a Globalist? Now it sounds like some of your servers may not have deserved tips due to poor service but to not tip bc you think it’s included is a bit naive i think. Just like AIs say tips are included to get bodies in the door when they’re really not, it’s all puffery. Hyatt reimburses the hotel for the food and the gratuity and yes that money is paid out to the staff. You really sounded like an obnoxious privileged traveler in the rant. Thanks. I’ve learned that whenever anyone is critical of anything they will be accused of being an obnoxious traveler. I’m not, but feel free to think that. Keep in mind that Hyatt reads this site and everything contained here is 100% true and I stand by it knowing that the hotel will probably read it. Also keep in mind that I am not asking for anything, but sharing a true experience at a hotel that calls itself 5 star and charges accordingly. Considering I never complained past the initial check-in confusion where I was told my suite that I paid for would be ready in an hour but it took 3 1/2, I can’t see how I am obnoxious other than I took notes and reported back later what happened. Was just there over Thanksgiving and I found the service to be too in-your-face friendly. So much so that it became annoying. The resort is very nice, but being trapped on a golf resort isn’t why I vacation in Mexico. Seemed like every time we’d finally find a bike, the golf carts would come out of the woodwork. My other complaint was the food (tried all 4 places) was just okay considering it’s the Yucatan. $75 for small lunch at a street taco place (without alcohol) is inhumane for 2 people. Each meal, we found ourselves reminiscing about all the wonderful places we’ve eaten at in Tulum in the past. “Is it worth an hour taxi ride?” In the end, I felt the Mayakoba resorts cater to the rich golf crowd who don’t mind paying $40 for a Pad Thai dish at Rosewood. So consider yourself lucky for not venturing out to the other places. Even though my room was already prepaid w/ cash & points, the invoice at checkout was difficult to swallow. We stayed there in April 2017. Used Hyatt points and paid to upgrade to the beach area. I agree that beach pool was too cold, but that was my only complaint. We had excellent lunches and dinners at Cocina Milagro and Casa Amate with attentive service. Maybe it was more crowded when you went? The prices were similar with the Fairmont next door, which we had stayed at previously. Loved the boat rides and walking between the two resort areas, although carts were plentiful. Enjoyed the gym and complimentary spa access. Shawn, thanks for the honest review. My brother has been thinking about heading here (I’ve been debating on sending him/his wife/my niece as a Guest of Honor) and everything online does look great — but service is key for him. It will easily make or break an experience. I’m going to sit down with him and go over your review — I think they may end up going back to the Papagayo and explore Costa Rica a bit more.